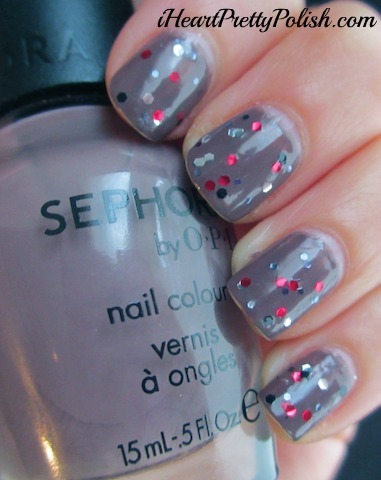 My Friday Favorite this week is Sephora by O.P.I. "Metro Chic". I picked up so many dupes of Chanel Particuliere and finally purchased this one as well. I am a big, big fan of purple/beige/grey nail polish. This is my one and only Sephora by O.P.I. nail polish, but I have a few more on my wishlist. I also find myself drawn to some of the glitters when I am in Sephora. There is a really pretty rose gold glitter that I have my eye on. This is a great color. And I never would have thought to add this polish over it! I like the combination; it really make the glitter pop. This is a great combo. It has quite a bit more purple tons in it and it's lighter. You Don't Know Jacques is darker and more chocolate brown. I love both and think a nail polish lover would "need" both:) hehe.